The AquaCalc Pro Plus comes with a set of four rechargeable AA size NiMh batteries that are recharged through the USB port using the included USB cable. Battery life is over 8 hours of active in field use. Battery recharging from complete discharge is 6 to 8 hours. 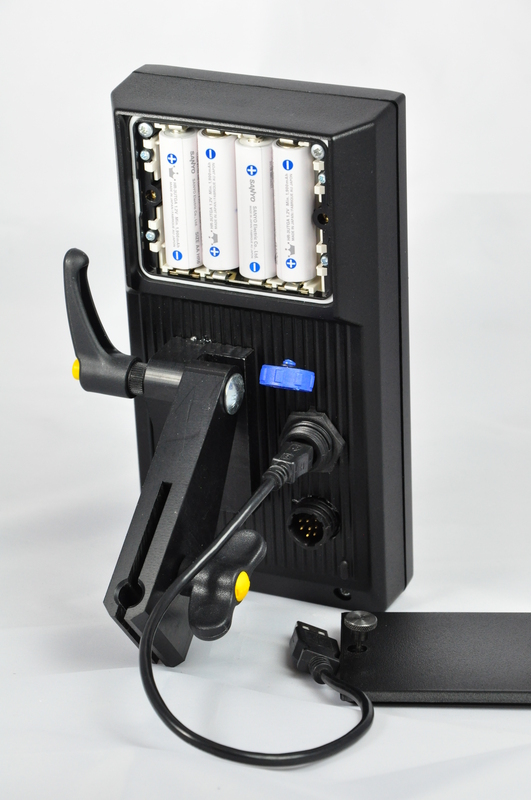 The batteries can be recharged by plugging the AquaCalc Pro Plus into your computer or a compatible USB charger including car adapters that fit in the 12 volt accessory socket of you vehicle. Optional spare batteries and chargers are available. 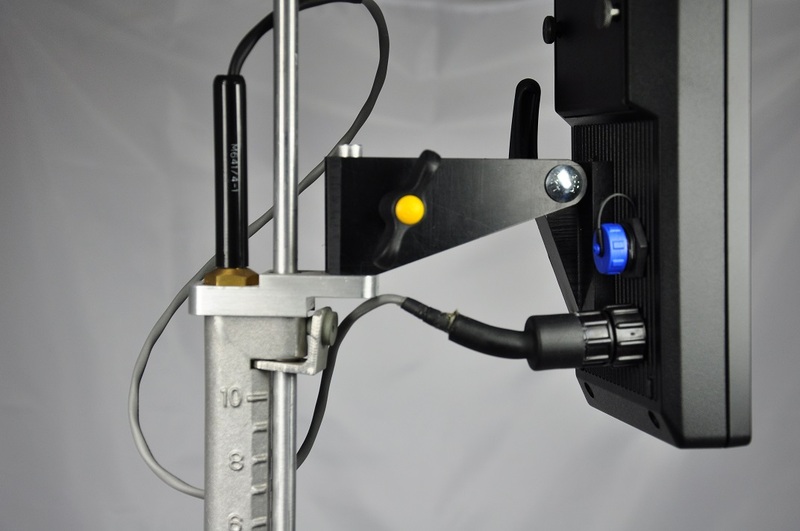 The AquaCalc Pro Plus comes with a Rod Mount to attach the AquaCalc to a wading rod or a bridge crane. and a two foot Current Meter Cable. 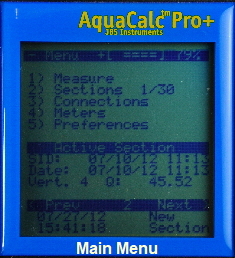 The Main Menu is the first screen that you see when turning on the AquaCAlc. A summary of the most recent section discharge measurement is displayed in the Active Section area. You may scroll through all of the sections in the AquaCAlc using the arrow keys on the keypad. The Measure screen is where the action is. The arrow keys are used to move between .2, .6 and .8 observation depths. 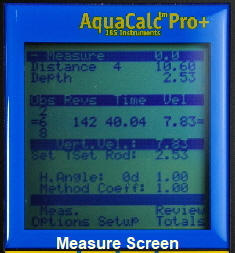 Dedicated keys are used to enter the Stream Depth, and tagline Distance. 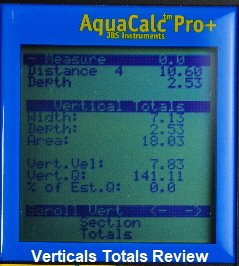 The display shows where to set the rod or suspended meter reel for proper observation depths. Instantaneous velocity is shown on the first line of the screen (0.0 here). The measured velocity for the observation point and the averaged velocity in the vertical are also shown. 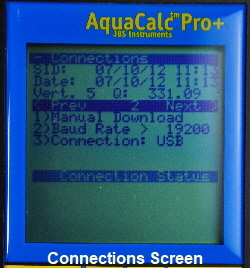 When in this screen, the AquaCalc Pro Plus will automatically talk to DataLink. Measurements can be reviewed, downloaded and deleted from within DataLink. Measurements can also be manually downloaded from this screen. Velocities and sub-section discharge for individual verticals can be reviewed in this screen.